A variety of spring techniques can be performed to enhance deer quality. As I scanned openings in the bush from behind my African trackers methodically analyzing every crumpled straw of grass trampled upon by a group of dagga boys we had been spooring for most of the afternoon, my anticipation to catch up to the old bulls began to fade as the sun dropped below the tall marula trees. As light faded, an amber-red skyline appeared on the Zimbabwean horizon. It was a fire, a big one, stretching uncontrollably for nearly a mile and rapidly heading our way. The stolid look on my trackers’ faces insured me that we were not in harm’s way, and when I looked at my professional hunter, he simply smiled. This was my first introduction to fire in Africa, and like Native Americans, fire in the Zimbabwean bush is employed to increase visibility and reduce old growth, making room for new plants extremely attractive to the animals they pursued. Early American settlers used fire to clear farmland and establish homesteads as well as to attract animals upon which they depended upon for sustenance. Prescribed fire in the U.S. today is applied by trained professionals in a methodical fashion to a vast amount of our southern forests, primarily to achieve various silvicultural objectives, particularly the enhancement of pine production. In some cases it is used to reduce litter build-up, reducing the possibility of wild fires. 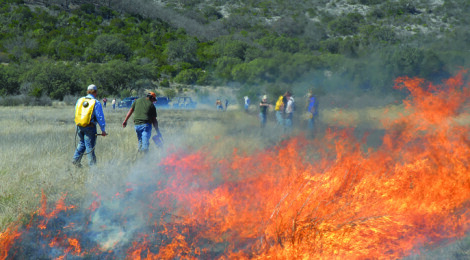 On Texas private lands fire is employed for a variety of reasons, but remains an integral part of improving habitat. The basic consensus regarding fire ecology is that it is neither destructive nor constructive as it simply causes change, and dependent on weather conditions, the end result can be controlled. Prescribed fire is defined as fire applied in a knowledgeable manner to naturally occurring vegetation on a specific area under select weather conditions in order to accomplish well thought out management objectives.